A reminder that the delightful Terry Spear will be with us tomorrow to talk about To Tempt the Wolf, the newest book in her werewolf romance series. Terry also tells us about her plans for the series and relates her 'first sale' experience. There will also be an opportunity to win a signed copy of To Tempt the Wolf or another book from her backlist. Terry will drop by to answer questions, so get your inquiries ready. 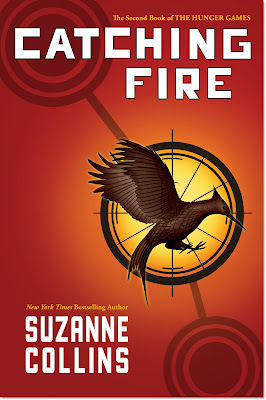 Today is the last day to enter the giveaway for the special prize pack for Catching Fire by Suzanne Collins. Contest ends at midnight. I`ll announce the winners Thursday. Don`t miss your chance for a copy of the hardcover, a limited edition T-shirt and a Mocking Jay pin. 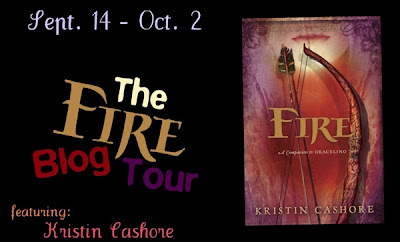 The Fire Blog Tour for Kristin Cashore`s new novel Fire has begun! This companion novel to last year`s critically acclaimed Graceling releases October 5. The Tour started yesterday and will be visiting SciFiGuy.ca on September 28 as part of a 15 stop tour. Each stop on the Tour features a sneak peak at a character from Fire (HINT: mine will be Tess) and provides an opportunity to win a signed copy of the book. In preparation for reading and reviewing Fire later this month, I am currently listening to the audio book for Graceling and am enjoying it thoroughly. You can see a complete list of the tour stops on Kristin Cashore`s website or view the list below. Exciting! I have yet to read Graceling but it's at the top of my wishlist. Falling Off the Shelf, I am just about done the audio book of Graceling and am enjoying it thoroughly.